I'm on leave this week, we've been to an old friend's wedding in Hampshire and had a few lovely walks in Cornwall and Devon whilst I've been off (makes us feel blessed to live on the Cornwall and Devon border, we have the best of both counties on our doorstep). This morning however, the weather changed and we woke up to rain. Some people might be upset to have rainy days whilst on leave, but for crafters it's the perfect excuse to get to grips with that project that they need to finish (or indeed, start a new one). 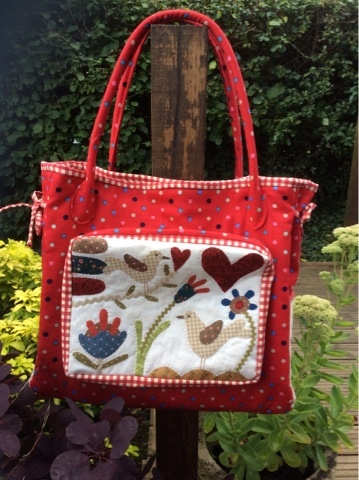 This is my Button Angel "Blackbird Garden Bag". I love how it's turned out. It's such a good size for shopping. It just so happens that there's a craft fair across the Tamar tomorrow, the perfect shopping opportunity for its first outing.